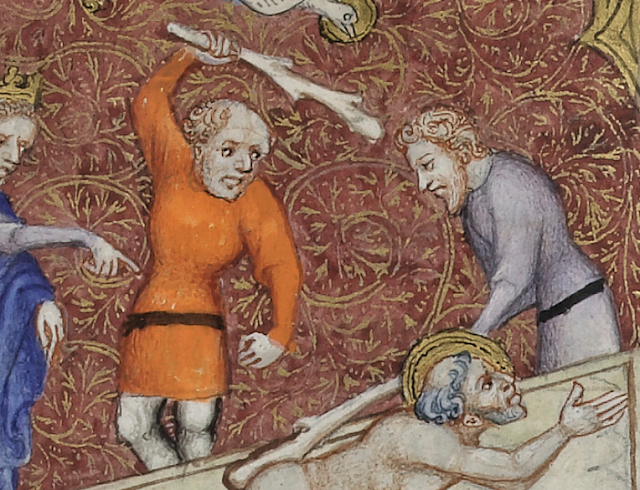 Last time, in our quest to build a late 14th century French outfit, we looked at a book of hours from Berry, France. 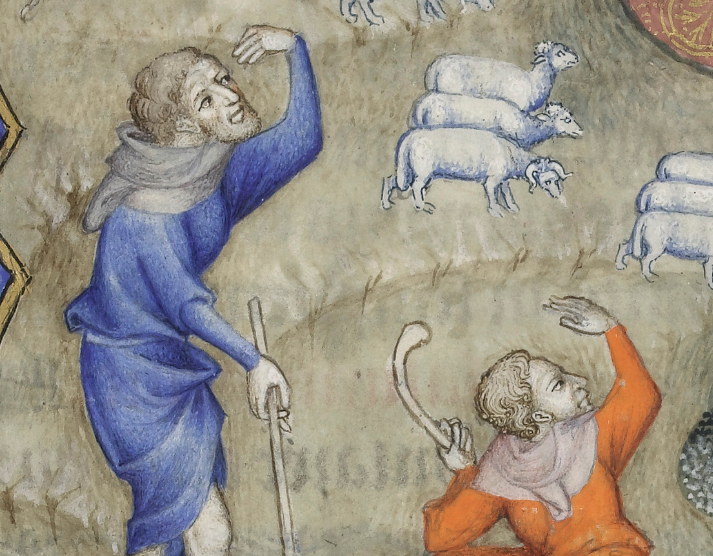 This time, let's look at a book of hours produced in Paris, nearby: The Hours of Philip the Bold. The manuscript was largely produced in two stages. The first was commenced in 1376 and paid for in 1379, with a few supplementary texts and images added in 1390. This fits nicely in our target time frame. We need to make sure we only get the first volume of the manuscript, which has all the 14th century images, and a few 15th century additions, but not the second volume, which is all 15th century. 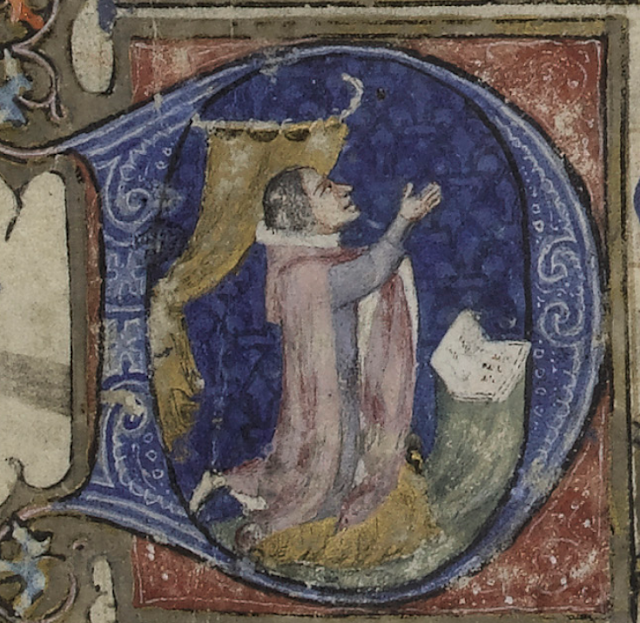 The Fitzwilliam Museum, which holds the manuscript, has kindly digitized it. I would have analyzed it earlier, but their website was a bit broken. 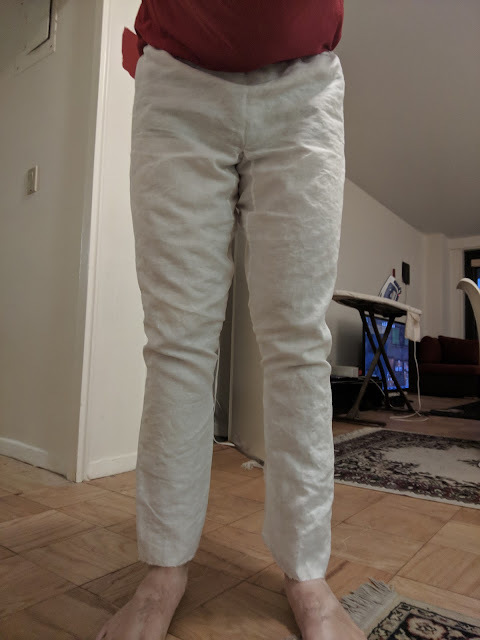 How common are poofier houppelandes vs tighter cotehardies as an outer layer? How long is the skirt on houppelandes and cotehardies? What kinds of headwear are folk wearing? How long are hood mantles? What kinds of dagging patterns? Bear in mind that we're looking to target a fashionable, wealthy noble or merchant, so depictions of common people are useful, but not specifically what we're aiming for. As I was doing implicitly in the previous post, I'm using the categorization from the Medieval Tailor's Assistant, which calls tighter garments with lots of buttons cotehardies, and looser garments with poofy sleeves houppelandes. I had previously called long-sleeved cotehardies without tippet sleeves "doublets" but have been advised that this designation is confusing. 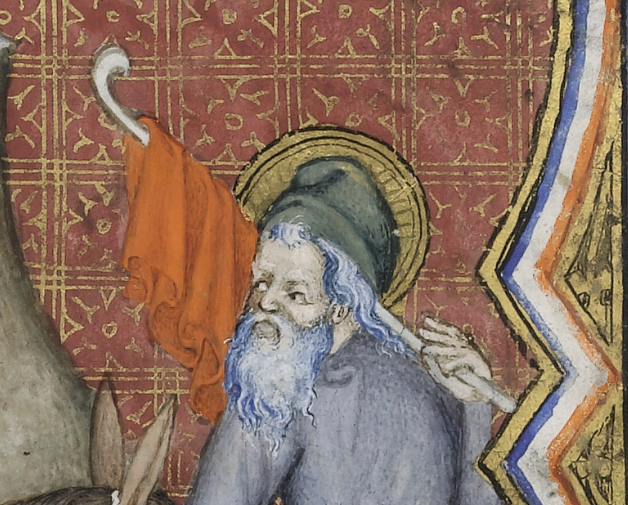 Folio 13r shows the patron wearing a mantle, some outer garment, and a tight-sleeved inner garment. The outer garment is at least knee-length. 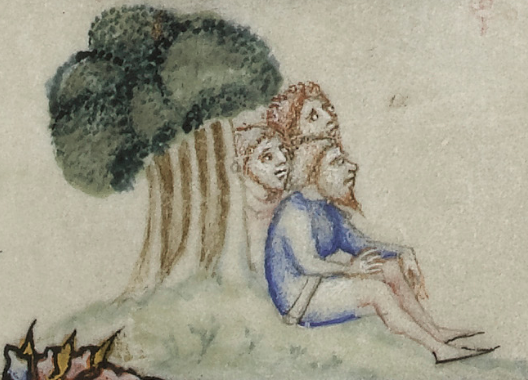 21r shows a scene of horse training, where a man sits wearing what appears to be a cotehardie. It reaches his mid-thigh, even while seated. 37r shows us another sleeve. 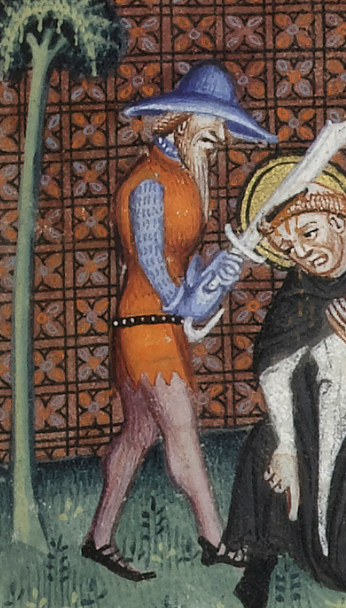 239r has a man ridding Henry II of this turbulent priest, and wearing a sleeveless garment over his armor. I don't want to draw too much from it because of its martial and English context, but the skirt length is consistent with other images at mid-thigh. And dags! There's a lot going on here that's weird. The hat? The hilt? His hair? A second depiction from the same page shows the characteristic buttons down the front of the garment, which at this point is probably a pourpoint since it's over armor. These are s k i n n y b o i s, and have pretty high skirts if we read the image literally, but perhaps they're not quite proportionate. 73r shows two people being, er, rather rude to this saint. Their clothing seems too baggy to fit with typical depictions of cotehardies, so perhaps they're a transitional houppellande style? On the other hand, these are lower class folks, so perhaps these garments simply represent less-fitted cotehardies. We continue to see mid-thigh or just-above-the-knee skirts. I originally had the following few images in the cotehardie section, but in the context of the above houppelande image I think they fit better into this section. 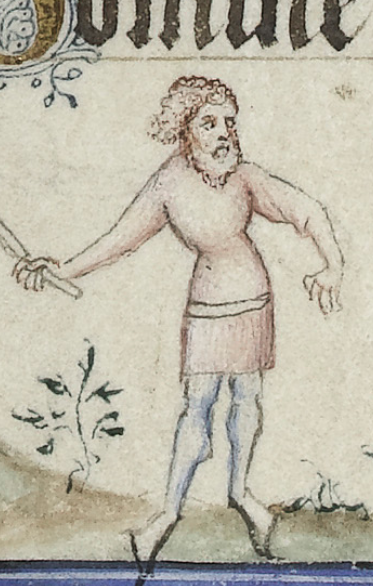 24v shows a man wearing a similar cotehardie, fighting a lion. 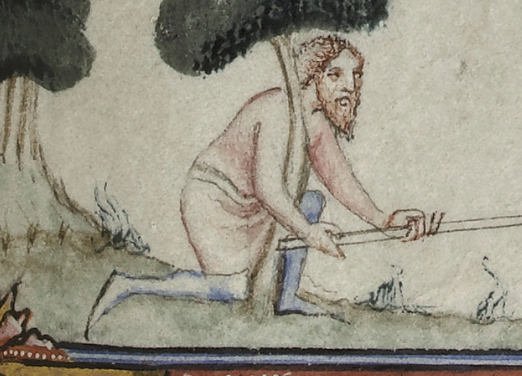 27r shows a man hunting a boar wearing what might be a cotehardie. It's interesting that the skirt has enough room for him to kneel as he is. 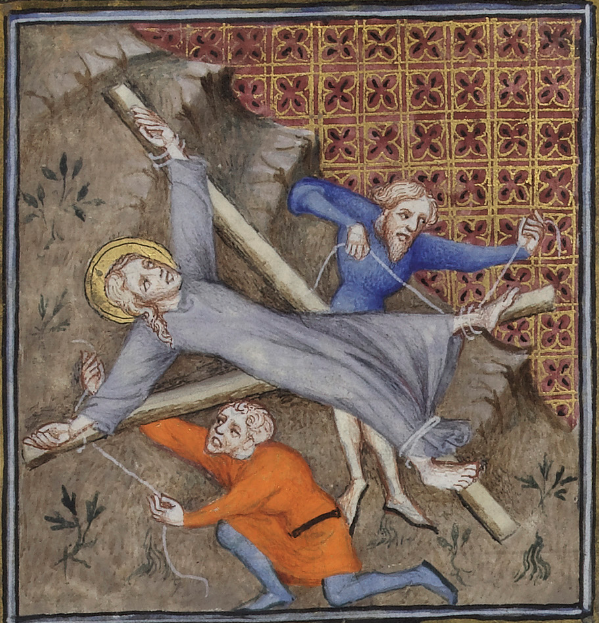 Could this be a short tunic, with hose, instead? Is this the same figure as in 24v? 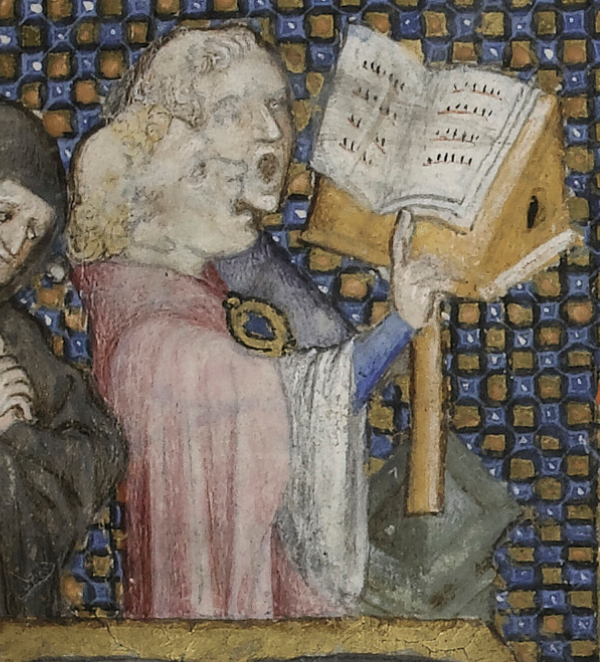 There don't seem to be any classical houppellandes in this text's 14th century images, then. 21r shows Joseph wearing a bag hat. Joseph appears in a bag hat in a bunch of other depictions as well. Maybe it's just a Joseph thing, or carrying some other symbolism? Sometimes it looks more like a Phrygian cap as well. Most of the images in this text of interest are either cotehardies, or baggier garments which are ambiguous, but the skirt length is pretty consistent at mid-thigh. We do have an example of hood sizing, but it's not totally convincing.